Don’t wait until a plumbing emergency is upon you before finding a plumber you can trust. Call (816) 886-7600 to reach All-n-One Plumbing and receive quality plumbing video inspection and sewer inspection services. Take advantage of our latest coupons and discounts and save on your next service. At All-n-One Plumbing, our specialists are trained to use specially designed cameras to help us get a better understanding of what is causing your plumbing issues without having to pull open walls, ceilings, floors, and even your yard. Using this high-resolution camera doesn’t just save you time and money, but it makes our job of providing the best solutions that much easier. Your friends and colleagues in Independence, MO and the greater Kansas City area have been relying on us for plumbing video inspection and sewer inspection services since 2007. What Kinds of Problems Can Video Inspections Solve? If peace of mind is your biggest concern, our technicians are happy to provide you with the option to use a video camera to inspect the problem area within your plumbing. We will show you a TV-style monitor with a color picture of the inside of your pipes, and will walk you through the problems and the best solutions. Being able to provide this visual element to our customers is something we are proud to offer. Cracks, damaged areas, and broken pipes. Offset pipes which have shifted due to frozen ground, settling, or landscaping. 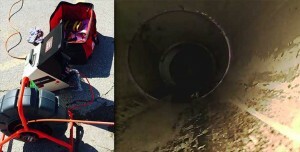 Blockages or foreign objects clogging your piping system. Leaky joints and problem areas. Get free quotes: We offer free no-obligation quotes for service before we begin working, so you can make the best choice for your needs. We are family owned and operated: All-n-One Plumbing is locally owned and has been serving your community since 2007. Speedy solutions to your problems: Our specialists are always on time and will begin working the moment you say “go,” so you can get back to your routine that much faster. We’re committed to customer service: All-n-One Plumbing specialists are dedicated to providing you with the best experience possible. Our customers deserve personal attention with every job, so you can feel confident and comfortable in your own home! Finding plumbing professionals in Independence, MO and the greater Kansas City area with your best interests in mind should not have to be difficult. Just call us at (816) 886-7600 and enjoy professional, dependable solutions that will leave you with the peace of mind you need.